You’re trapped on the 99th floor of a pitch-black building, and the only way to escape is by solving puzzles with numerical answers. It’s a completely normal scenario to be stuck in, surely, so there’s no reason to panic. Keeping it cool will help you reach the exit. Zero Escape ($0.99) is quite a nifty puzzle title that gives you large doses of nostalgia while keeping gameplay moving with an hourly system to earn hint credits. Let’s get this out of the way: it has nothing to do with the popular Japanese adventure series of which it shares its name. It’s not even close to similar, and that’s okay. There really is very little narrative in Zero Escape; what I’ve already described is about it. The content comes from the 99 problems that require a solution. It begins easy enough: “Blind Mice” is three, “Easy as ABC” is 123, and so on. 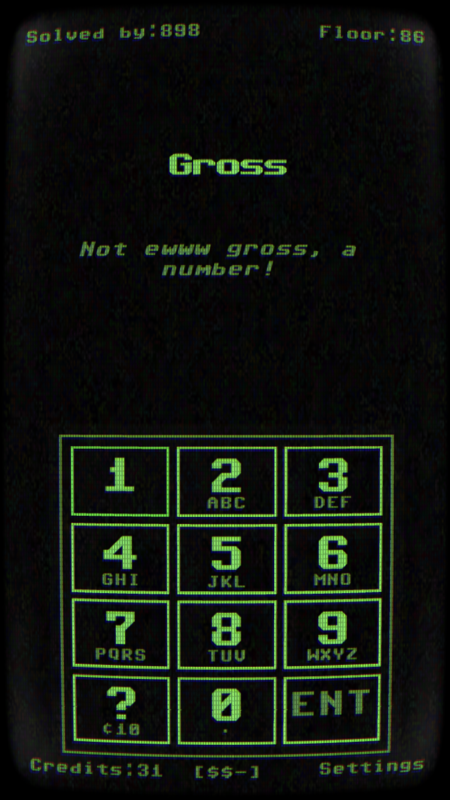 The difficulty increases as extra elements are added, such as the period or typing as though you would on an old cell phone keyboard. The answers rooted in pop culture may just be my favorite; it’s with glee I can answer “90210” when the question is “Beverly Hills” (I am proud to say I was among the original fans, and less proud to say I loved the more recent iteration). Other questions are surprisingly obscure. For example “Birth of Relativity” sounds like it would refer to the year Einstein discovered relativity, but it’s Einstein’s birthday instead. Now, I’m not exactly the world’s most patient person, but I never found I felt extreme frustration towards the game, even when I was stuck. The questions themselves are mostly universal, something someone in any part of the world may be able to answer. The history questions did seem to lean to the American side of things quite heavily, but otherwise they cover just about any trivia tidbit involving a numerical answer. I’ve actually learned from the questions/hints: I now know what number “score” represents and have reclaimed my ability to spell “hello” upside down on a calculator. The best comparison I can think of for the questions is what you would find in a game of Trivial Pursuit, if the game only had numbers as answers. I really appreciate the game’s credit system. And when I say credit system, I don’t mean there are in-app purchases. Each floor has one available hint, costing a certain amount of credits. The lower the floor, the more credits it will cost to access its hint. You begin the game with a handful of credits, but after that you can earn them through missions. The missions contain a handful of mathematical questions, normally addition or subtraction, sometimes multiplication or division. The best part is that it resets at the hour mark, so you’re not waiting 24 hours to earn more credits and get past where you may be stuck. And you’re not paying to progress either, another important note. While Zero Escape shines in its ability to earn credits (without paying actual money! ), it does tend to suffer with regards to the hints provided by credits. Later levels could especially benefit from having multiple hints available, even at the high cost. Another small problem I have with the game is its lack of a Clear or Backspace button – the perfectionist in me despised having to hit the Enter button knowing full well there’s something wrong with the answer I’ve given, solely because my finger slipped or I obviously miscounted. Zero Escape is truly a mobile game, in that it can be played in any scenario. If you’re bored on the subway while staying steady with one hand, you can play with the other. There’s no music or sound effects absolutely necessary (although the retro bleeps are also very much appreciated) to progress in the game thanks to its entirely linear structure. It may be too distracting though, so keep an eye out for your stop. If you have thirty seconds free, you can pick it up; if you have thirty minutes free, your brain will most certainly have a workout. While you can play one-handed, you definitely won’t find yourself playing infinitely. The bottom floor is in sight, along with the end of the game, and prior to success I find myself having to prepare to grieve the end of the experience. But that’s a hallmark of a good game, isn’t it? One you fear the end of? And the end isn’t all bad when the experience is enjoyable. 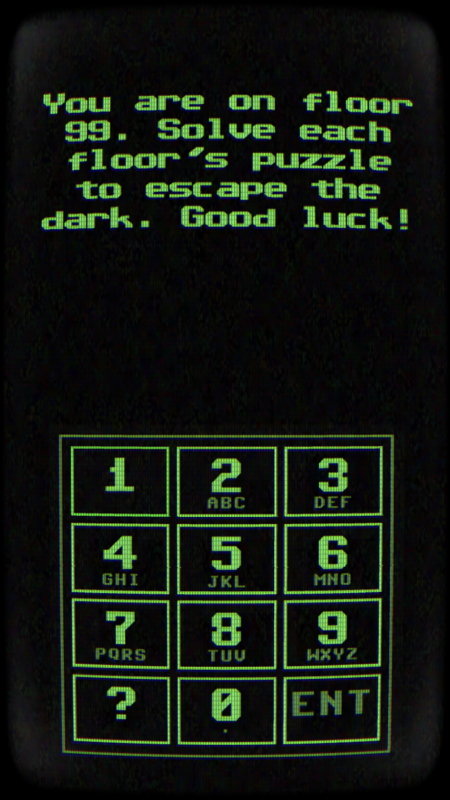 Graphically, Zero Escape is stuck in the era of early cell phone screens, with bright green letters and numbers practically popping off the black background. The sounds match the retro vibe with zing and boops seemingly coming straight out of an old computer. My favorite is when the graphics and the sound combine to create an image on the screen: the picture appears in characters, line by line, accompanied by a dot-matrix printer sound. Despite loving the pop culture questions, it’s these image questions I really looked forward to seeing. If you’re looking for a straightforward, one-handed, one-time-payment puzzle game, Zero Escape may very well be it. The retro sounds and graphics delighted the kid (and teenager) in me. The difficulty curve was never insurmountable, and you’re never asked to spend more actual cash to get hints. The hourly mission is a great way to keep those stuck on a level motivated to keep revisiting it. There is this nagging voice in my brain regarding some questions lacking completely logical answers based on the phrasing, but even these questions just required a couple more tries before moving forward. More importantly, when contemplating the title, I recall the pop culture references as well as the sheer variety of questions available to answer more than anything that voice in my head wants to complain about.